"Educating Esme" was first published in 1999. It won the American Library Association's ALEX Award for outstanding book for young adult readers and first place for national education reporting from the Education Writers Association. Lauded for its honest, smart and spunky in-the-trenches look at first-year teaching, the book has also become an immense favorite for education course adoption. Early one morning while preparing breakfast, I started reading "Educating Esme: Diary Of A Teacher's First Year" by Esme Raji Codell. That was not a wise thing to do. Breakfast got burnt. Kids were frustrated with mommy. I just couldn't put down the book once I started. Of course I had to force myself to do it by talking to myself in the second person. "Educating Esme" went everywhere with me for a week and a few days! The very first chapter reminded me of a time in my childhood when I dreamed of being a teacher and how fabulous I'd be in mothering and teaching the children. Slowly that dream kind of faded out and others took its place as I grew into adulthood. Madame Esme is so fresh and alive and true. I say true in the form that she shared herself purely and not superficially as people usually expect of each other. Because we honestly don't want to know about the smell of the other person's real life do we? Or if we do, we want it to smell just like ours so that we can accept it. I dream of being as passionate about my ventures and dreams as Madame Esme in her sharing of her life with these children. There is a little bit of everything in this diary. You'll laugh and cry and learn and be inspired all in one. Something I'm reminded to model with my own children is mentioned by Esme in her diary: '...a soft voice is more effective than a loud one...' It is also in the Proverbs too! I seriously need this written in bold on my house walls. noun - The act, process, or art of imparting knowledge and skill. Aren't those so much more fun and less clinical? There are quite a number of books mentioned in Esme's diary which I've saved on Amazon to purchase. I especially love her conflict resolution style and have used that with my siblings and mother when we first met! I cannot wait to read "The Hundred Dresses by Eleanor" Estes to my own children. I want to give them a wide variety of reading materials and I'm so glad reading to them comes naturally as I'm a lover of books too. The time is closing in when my children will go off to school and I'm always wondering what their teachers will be like. I can't help but wish they will have an Esme in their lives. But isn't it true that people like Esme only come around once in a good while? 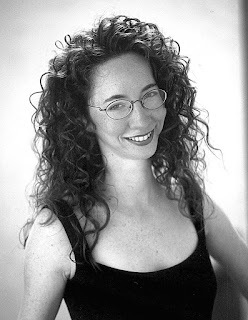 In the words of Connie Porter, author of the "Addy" books in The American Girls Childrens Historical Fiction Series: "The world should be filled with teachers with Esme's energy and imagination." I wonder if I had a teacher like Madame Esme, would my life have taken a different path? In my school, there were the teachers' pets and then the others suffered or were non-existent. I was the latter. I remember Math class. I was always so nervous that I wouldn't do well, yet I would excel in the subject anyway. I wanted to learn so badly that I approached my teacher one evening after I was sure everyone left and he shouted at me like I was stupid just because I was not getting a problem right. I shut down. I stopped going to class. All my tests in his class were in the high 90s score. Despite his attitude, I wished that I had stuck with it. I feel cheated somehow and it makes me really sad, and I just know I could have excelled in Math. Which brings me to another quote from Esme's diary, "Nobody knows which is happening when the teacher closed the door. At worst mediocrity. At best, miracles." Esme's interaction with the children in her class made them want to come to school. So much so that one child even brought a younger sibling because of circumstances at home. At the girls' home (orphanage) where I grew up, some of us were allowed to go to public schools. For me, I didn't want to go to school and I didn't want to go home. I loved school, but I felt trapped in my shell and couldn't express myself. Therefore it made me stressed to be in school with teachers who didn't see me, instead of just a paper. Add to that the stress of gang warfare and the constant taunts of being government children. But I had a teacher. Her name was Ms Brown. She saw me and that is why I excelled in her class and indeed I dreamed of her being my mother many times as I didn't have one. "So much of teaching is sharing. Learning results in sharing, sharing results in change, change is learning. The only other job with so much sharing is parenting. That's probably why the two are so often confused." 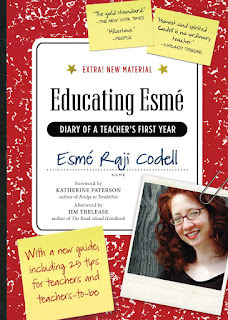 The expanded edition of "Educating Esme" shares more of Codell's ingenious yet down-to-earth approaches to life in the classroom in a supplementary guide to help teachers hit the ground running. And Codell's tale resonates just as strongly today as when it was first publish. Celebrated writer Katherine Paterson, author of "Bridge to Terabithia", writes in the new foreword, "Are we simply to read this book with delight and then close it with a sigh?...Today so many creative and devoted teachers not only have to struggle against unimaginative administrations, fearful parents, and wearied colleagues, they have also to battle entire legislative bodies that have never taught a child...Esme helps those struggling in an alien climate to be successful teachers." I find myself entertaining thoughts of giving a copy as a gift to my kids prospective teachers! :) Esme's list is great and good for parents too. Esme also encourages teachers to find time to replenish themselves outside of the classroom as they can burn out quickly. This is the very same for parents. A well-known quote by educational consultant Neila Conners warns: "If you don't feed teachers, they eat the children." There is also a Teacher's Shopping List included in her book! A little bit of everything I tell you! I feel so privileged to get a glimpse into the classroom and school system through the eyes of a teacher as wonderful as Esme Codell. I really enjoyed reading her diary. Q- Your book left readers wondering if you continued your education career. What have you been up to? Esme- By the time "Educating Esmé" was published I’d already been teaching in the Chicago public schools for a number of years. Eventually I resigned from my school position to work on other projects and to realize other dreams, including national advocacy for literature-based learning and read-aloud; home-schooling my son through a crucial year; writing several novels for preteen readers; running a children’s literature review website; and starting the PlanetEsmé Bookroom, an independent venture in Chicago for which I opened a storefront salon and resource collection of about 12,000 children’s books and offered free programming to my community. 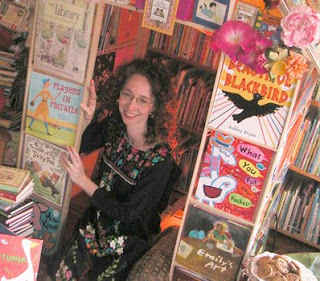 Connecting great children with great children’s books has been the underlying thread of all my work. I imagine returning to the public schools again at some point. Q-In "Educating Esmé", the children refer to you as Madame Esmé instead of Ms. Codell. Do kids still call you Madame? Esme- Everybody calls me Madame. It’s my nickname. I received a lot of criticism about hanging on to the moniker Madame that first year. That’s one thing I don’t regret in the least. I think names are powerful and personal and part of the American idea of reinventing yourself. To read the entire interview, please visit this HERE. Sounds like a very good book. I could never be a teacher but admire those who are. My son has had two really great teachers so far and he loves school because of it. I just hope it continues this way for him.